Our team of highly qualified & experienced workforce helps us in offering Scrap Straightening Machine. This machine is a useful equipment to straighten the scrap bars to be put to use again. The machine has a provision to cut crocked ends of the bar so that it can be put into the machine easily. The machine helps the avoiding the wastages of steel and encourage of straightened smaller diameter bars in involved project. It is characterized by advanced design with safe, reliable and easy operation as well as stable performance. 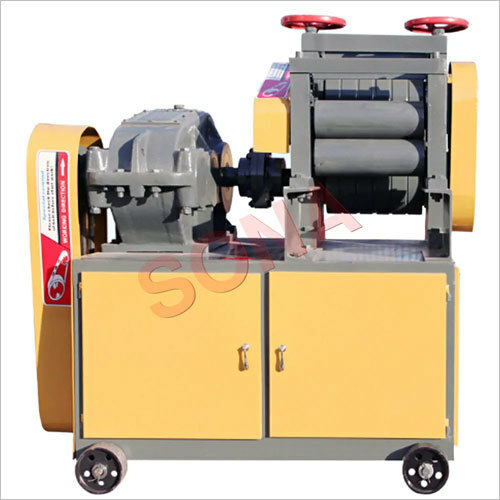 Scrap Straightening Machine is easy to adjust for rolling steel bars in different specifications. 1) Scrap bar Straightening is Characterized by advanced design with safe, reliable and easy operation as well as stable performance. 2) Processing Parallel thread for ribbed rebar 16mm-40mm. 3) Rolling Wheel has long service period, low additive cost of connector. 4) Easy to adjust for rolling Steel bars in different specifications. 5) Durable, Cost Effect and Reliable.